If you're a professional developer and regularly work with distributed teams, I'm sure you're familiar with Git. It's a powerful distributed version control system that is quite popular among the community of developers and programmers. Power users using this software are very much comfortable with the command line environment which allows them to complete the tasks rapidly. Though it's not a rocket science to master its command line directives, a user-friendly GUI based extension can help you grasp things easily after continuous usage for a few days. There are several Git clients with graphical interface one can use to manage his project repositories. Under the hood, these extensions use the power of Git directives and relieve you from somewhat cryptic commands while maintaining a very large project. We're going to look at some of the best and popular graphical Git clients which can help you kick-start your project workflow through this distributed version control system. Let's version control our code. 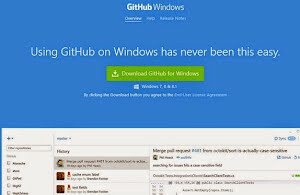 GitHub for Windows - I regularly use this Git client on my Windows machine to manage all of my local project repositories. It can be used to manage both local as well as remote project repositories hosted on GitHub service (both private and public). With a stunning interface, it is one of the most popular Git clients for the Windows platform. This client is only available for Windows 7 and up platforms and you cannot run it on Vista or XP machines. Installation is dead simple and you can get started with it instantly. Following are some of the killer features offered by this excellent graphical client for Git. Light and impressive interface - As I mentioned before, its interface is very good and the application itself is lightning fast consuming very less system resources. Actively updated - It has a very active development life cycle and new features are added to the application on a regular basis making it more powerful than its predecessor. Free to use - The best part is that it is completely free of cost with no restrictions so one can use it without spending a single dime. Works seamlessly - Since I'm an avid user of this client I never faced any usage issue till date while working and managing my projects through this powerful program. GitHub for Mac OS X - And, this is the same client for the Mac platform. It has all the features and benefits its Window-based sibling has and it runs smoothly on any Mac machine. You need 10.9+ OS X to run this Git client. Its one-click functions can help you perform big tasks in a single go without any hassle. I've tested it on a 13" MacBook Air for about a week managing 2 repositories. There are subtle differences between the Windows and Mac client but overall the functionality is the same as matching options. Following features makes it one of the preferred Git clients for the Mac platform. One click operations - As mentioned before, one can easily complete multi-step operations through a single click while working with this Git client. Free to use - Needless to say, this Mac based client is free as well like its Window based sibling. Active development cycle - This client has the same agile and active development life cycle which includes addition of key features and improvement of the existing ones. Lightning fast - The application itself is a zipper and runs smoothly even on Mac systems with old configurations. SourceTree - This is yet another powerful Git client available for both Windows and Mac platform that not only supports Git but several other distributed version control systems. It also has a rich and user-friendly interface with support of almost all of the common Git operations one can perform through a command line. I liked the prompts and visual hints this application gives to the users to ease the task. You can run it on Windows 7+ and Mac OS X 10.7+ systems. Following useful features are included in this excellent graphical Git client made for professionals and software developers. Perfect for beginners - If you've never used Git before or just starting with it, this is the perfect Git client to start with. Connects with multiple services - It is one of the few clients which include support of integration with popular Git flavored services. Supports advanced operations - Powers users can easily take advantage of all the advanced Git options baked right inside this awesome client. Free to use - And, this is yet another free Git client one can use without any restrictions with awesome new features added in each update. Gitbox - This is the first premium category Git client included in this list which runs seamlessly on Mac platform. It is a 5 star rated application with a decent user base that itself is enough to give you a glimpse of its popularity. This Git client can easily integrate with several 3rd party applications and services to ease your entire project workflow. Through its easy-to-use interface, beginners and intermediate level users can easily manage projects with multiple branches and a distributed team. Let's check out some of the intuitive and helpful features offered by this powerful Git client application. Stunning interface - Like every premium application, this Git client has an excellent interface with easy-to-use controls. Powerful search - Its repository search is very powerful and can find information in a large project repository, almost instantly. Advanced Git workflow - Power users can take all the advantage of advanced Git commands supported by this application. Handy keyboard shortcuts - It also has a rich collection of keyboard shortcuts to help you get things done in a quick way. Tower - It is one of the few Git clients for Mac platform which includes dozens of unique and intuitive features making it stand out amongst the crowd of other clients. It is used by developers working in big organizations to manage big projects. It comes with a fully functional 30-day trial version to get the feel of its power and simplicity. This is yet another premium solution which integrates seamlessly with popular 3rd party software development tools. It has one of the most extensive documentation to learn about its features and functioning. These features are part of this useful Git client. One click operations - All standard and advanced Git commands can be completed in a single click while working with this application. Automate selective tasks - Power users can also automate certain Git workflows to save time as well as to improve the entire workflow. Clone in background - For very large projects, you can trigger cloning of repositories in the background while you work on other areas of the project. Drag & drop support - Apart from point and click task completion, one can also take advantage of drag & drop feature to complete all the Git commands. SmartGit - This premium Git client can run on Windows, Mac and Linux. It has several smart features and is best suited for professional teams working on big projects. Apart from GitHub, it also supports several other Git and SVN platforms. This application maintains a powerful log with the support of filters to keep watch on the internals. Very few Git clients have drag & drop support and this is one of those clients. It also silently fetches your favorite repositories in the background so that you can work on the active project without any hindrances. Check out some of the impressive features of this app. Markdown support - All Markdown files in your project can be viewed in the supported format directly within this client without any need to rely on external viewer. Optimized file comparison - It has one of the best file comparison utility that can clearly highlight the changes made throughout the file history. Built-in SSH client - It also has a SSH client to easily connect with remote servers without leaving the application at all. Custom commands - Power users can also integrate external tools by specifying custom commands and adding the options directly within the application's interface. git-cola - This is one of the Git clients' ideal for power users and tech ninjas. It supports a large number of keyboard shortcuts to speed up the repository management process. It also includes a large number of configurable variables which can be used to change the appearance and behavior of the application. One can also create custom GUI actions to ease the workflow for repetitive tasks. This is another client Git client having an active development life cycle with continuous optimization of the features and functions. Take a look at some of the useful and handy features of this powerful graphical Git client. Light and blazing fast - The moment you'll start using this Git client, you'll realize that it's comparatively very light on system resources. Free to use - This is yet another free to use graphical Git client without any kind of hidden restrictions. Command line support - Power user can also take advantage of its support for useful and flexible command line options to speed up the tasks. Configurable logging options - Users can also instruct the application to generate custom log files matching with your needs. GitEye - Companies with large teams working in distributed environment can use this premium Git client to manage their important projects with ease. No matter where your repositories are stored, this application can pull them with ease. It has a dedicated module for tracking file changes so that teams can easily work on the same file without any conflicts. It can also integrate itself with several 3rd party developer-oriented services to ease the entire project management process. Let's check out some of the intuitive and user-friendly features included in this flexible graphical Git client. Excellent interface - It has a powerful and feature packed interface which allows even beginners to manage repositories with ease. User friendly history management - One can easily go back to the timeline to easily track, observe and edit the change made in the repository. Dedicated support - Since it is a premium solution, you'll get exceptional support to get more out of this Git client. Maintenance free - This application receives major updates and patches in the background so you're free of worrying about updating this Git client. GitUp - Mac users can also try out this feature-packed Git client which includes some user friendly features. Its blame viewer is one of the best and allows team leaders to inspect file change history in a better way while working with large teams. Handy redo option allows newbies to revert to the old state without worrying about changes made inadvertently. Make sure you're running Mac OS X 10.6+ to run this Git client. Its file filter function allows you to quickly locate files in a large collapsed source tree. So, let's see some of its features and functions one can use to manage his Git repositories. Easy conflict resolving - Users often panic whenever a branch conflict arises while working with repositories. This application help you resolve it in an easy way. Powerful file history viewer - Each team member can view the complete file change history in two different formats. Live map - Easy map visualization of the entire repository ensures you can easily pick and choose the work area without any issues. Quick shortcut keys - Power users can master the shortcut keys to complete the tasks at a lightning pace saving lot of time. GitX-dev - And last but not the least, this handy Git client is another option for Mac users which has a nice and user friendly interface. It displays file changes in a very nice format to easily visualize the changes. Although it's a free Git client, yet it has full drag 'n' drop support. Developers can also use its blame view to keep an eye on the team members and the work they're doing on the code base. Unlike other clients, this one performs smoothly even when working with very huge repositories. Do check out these handy and very useful features that are part of this powerful Git client made for teams. Less memory usage - I've tested it thoroughly and found that is it very memory efficient and works seamlessly on low end machines too. Integrated command line tool - Professionals and power users can take the advantage of its command line module to perform complex tasks with ease. Author & revision based search - Team leaders can easily perform quick search within repository based on specific author and revision history. Easy source tree scanning - The user friendly interface facilitates quick and easy scanning of a large source tree.